At this point, I didn’t know if it was a buck or a doe. I waited 30 minutes and decided to walk to where I’d seen it last. Big mistake! In my tactical training I learned to break out of the tunnel vision habit and to continuously scan the environment as I move forward. Seems simple, but the tunnel vision created by buck fever had an unfortunate override button in my brain. Silently moving from tree to tree, I focused on the last spot I’d seen the deer. I was now at the last tree providing cover and failed to scan my left and right before moving forward. In that instant, the same deer I’d seen earlier bolted from a bedded position just ten yards away from my left. It was at a full sprint running directly away from me by the time I realized what was happening. I engaged the deer and shot once. I ran roughly 25 yards hoping to flank the deer in the event it tried to run towards the field. Because of the cold, my hamstrings were tight and they didn’t want to cooperate with my plan. I shot twice and the deer simply vanished as if the earth swallowed it up. Honestly, given the scenario, it would have been pure luck if I’d hit the deer. After taking in the shock of missing my opportunity, I caught my breath and adjusted to the disappointment. I learned a few lessons as the thoughts of what I should have, could have and didn’t do rolled through my mind. A few snowflakes and some frozen rain fell as I walked back to my stand. By 5PM, it was coming down hard and the overcast skies turned a bluish glow. It was beautiful to see, but difficult to navigate. It’s amazing how easy it is to lose your bearings when it’s snowing. Monday morning marked a significant change in the weather with nearly four inches of fresh snow on the ground and painfully cold temperatures. We headed out to a different property, a local farm where Kelly was doing roofing work. The transition of darkness to light as the sun rose was worth getting up for. The darkness turned into a bluish glow as the sun rose. We quickly found spots to set up and patiently waited for deer to start moving. It was 19 degrees and the wind gusted as high as 32 miles per hour that day. 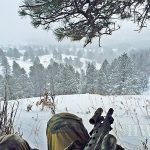 I’d never hunted in snow and freezing temperatures until this trip. At 10:30 AM Kelly spotted a young point buck sprinting through the woods heading towards Dad and me. The buck sprinted through the cornfield and I didn’t spot him until he was just at wood’s edge, approximately 60 yards away. I grunted loudly a few times to get him to stop, but he didn’t stop. He sneaked into the woods and vanished. I didn’t have a clean shooting lane and didn’t fire. I hoped he’d simply come back my way. He never did. The next few days were extremely cold with wind chills below zero. Tuesday was the coldest with a -6 degree wind chill and weather warnings to stay inside. I convinced Kelly to go out anyway and we stayed out until 9:30 AM. My Dad opted out. It was so cold that morning that ice was forming on my eyelashes. Another first! There was little to no deer movement. We’d see tracks in the snow in the mornings that told us they were only coming out at night. I was discouraged, but hunting is never a sure thing. Now its Friday morning, my last day in Indiana. I’ll be flying back to Miami that night. Kelly and I were still looking for something to shoot. He got his buck during archery season and we never recovered the doe he shot earlier. It was ten degrees just after sunrise and fresh deer tracks were everywhere. The morning passed with no deer and the thought of heading home empty handed was becoming more real by the minute. It was 2:30PM and I lowered my rifle to the ground. It was time to go. But Kelly called and said he’d walk the woods directly behind me to see if any deer were bedded down. I carefully raised my rifle back up to my climber and waited patiently. Fifteen minutes later I heard a gunshot. A few minutes later I heard something coming from my left. It was a six point buck running from something. It looked confused, looking for somewhere to run. I quickly grunted twice as I aimed my 450 Bushmaster equipped with an EOTech holographic sight directly at his chest. BANG! The power of the 250g Hornady bullet pierced his chest, blowing out both lungs and exited his abdomen, cleanly breaking his left rear ankle. He dropped immediately. What an unbelievable and amazing finish to a long and painfully cold week! In the end, I shot my buck on the last hour of the last day in Indiana. Hunting rarely provides immediate gratification, but it’s great for character development and life lessons. There are many more disappointments than successes and preparation is key to keeping the odds in your favor. That’s true mentally, and true for your gear. My Froglubed 450 Bushmaster performed perfectly in sub zero temperatures. I somehow managed not to freeze. I’ll probably change guns again. I’ll buy more thermals and camo. It’s the memories of the struggles and victories from that trip will stay with me for the rest of my life. This entry was posted in The Tactically Trained Hunter - Erik Alexander and tagged .450 Bushmaster, Deer, EOTech, Hunting, Inidana by Erik Alexander. Bookmark the permalink.